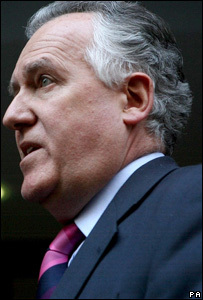 Peter Hain was right to quit the Cabinet, but it was a "terrible waste," Welsh politicians have said in reacting to his resignation. Mr Hain quit as Work and Pensions Secretary and Welsh Secretary after his deputy leader campaign donations were referred to the Metropolitan Police. Welsh Liberal Democrat MP Lembit Opik believes Mr Hain had no choice but to step down after police became involved. He joined other politicians who paid tribute to his work in Wales. "I have said all along that if he ended up in a situation where the police were involved he would probably have been too preoccupied with that to carry on," said the Montgomeryshire MP. He worked alongside Mr Hain when the Neath MP was Northern Ireland Secretary and Mr Opik was his party's spokesman. "It doesn't mean he's guilty, let's stress that point. "But I think this is really sad because in the 10 years I have worked with him , particularly in Northern Ireland and in Wales, the man showed first-class integrity and really helped to broker peace which is saving lives every day in Northern Ireland." Elfyn Llwyd, Plaid Cymru's leader at Westminster, said Mr Hain had "done the honourable thing." "I believe that his position was untenable when this Progressive Policy Forum came to light. We still don't know exactly what it is because nobody's been able to offer a sensible explanation for what that forum did or does." Mr Llwyd said Mr Hain had played an "important role in the constitutional development of Wales." "He certainly played a crucial role in steering the Government of Wales Act through Westminster The events of the last few weeks should not detract from that." Alun Cairns, the Conservative AM for South Wales West, said Mr Hain had no choice but to resign. "Personally I am disappointed for Peter Hain, he has been a minister who has worked hard on his own priorities and his government. It's a shame that there has been some mistakes," he said. "I do hope he can clear his name and that he will have a career in the future. "I didn't agree with his priorities but he has been successful and as a party we have respect for him as an individual for the work he has done." 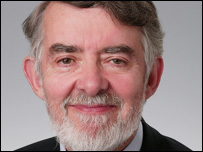 Paul Flynn, Labour MP for Newport West, said Mr Hain had been a "powerful voice for Wales." Mr Flynn added: "It's very disappointing and he's clearly done the right thing. Peter as a person of integrity in saying that if a cabinet minister is under investigation for a matter of this kind he should resign." Albert Owen, Labour MP for Anglesey, said Mr Hain was taking the donations row "personally". "He's a very competent, able minister and he has been kicking himself more than anybody else and turning this over in his mind and he will take this very personally," he said. Mr Hain's former election agent, Howard Davies, said it was a great loss for the constituency to lose a man at government level. "It is up to the police to decide what they've got to do. We've had investigations before and people have been cleared. "And there's no doubt in my mind that basically Peter Hain is in the clear here because he's a very honest man." No announcement has been made on Mr Hain's successor.